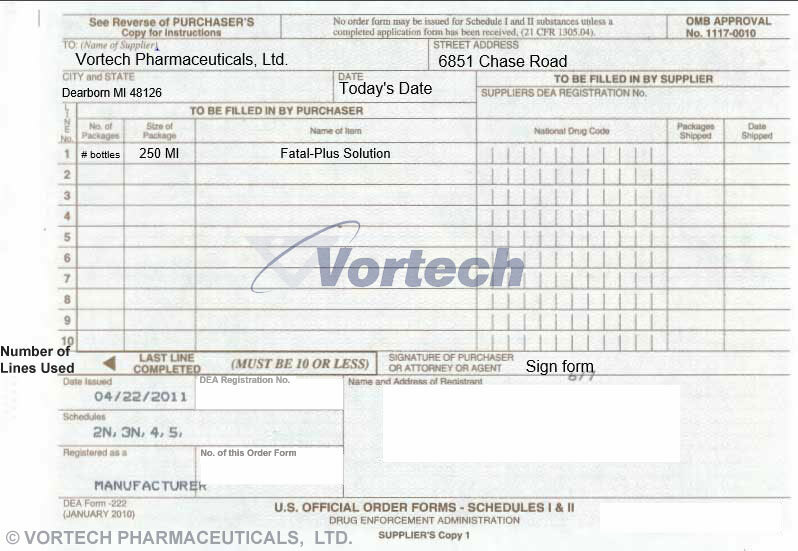 How To Order | Vortech Pharmaceuticals, Ltd.
Fatal-Plus Solution and Powder is a Schedule II (C-II) drug, and therefore must be ordered on your DEA 222 Form. Please see the link to our New Customer Application and a link and procedures for ordering your DEA 222 Form. In an effort to reduce the number of ordering errors, and to provide you with the product you need as soon as possible, we have developed a list of helpful pointers for use when filling out your 222 order form (U.S. Official Order Forms – Schedules I & II) for Fatal-Plus Solution or Powder. Please read the instructions on the back of the 222 order form. Your 222 order Form must have the 2N license We cannot process forms with only a 2. We cannot accept any 222 order forms which have been altered in any manner. If you make a mistake filling out the form, a completely new form will need to be filled out. Incomplete, altered, and incorrectly filled out forms must be returned to you. We can only ship to the address which appears on your 222 order form, NO EXCEPTIONS. Clearly print all required information WITHIN the appropriate boxes and lines on the 222 Form. Fill out our Physical address (6851 Chase Road, Dearborn, MI 48126) in the top portion of the 222 order form. Our physical address is the only acceptable address for this form. Do not fill out the ‘Suppliers DEA Registration ’ box, we will complete this section. Do not fill out the ‘National Drug Code’ box, we will complete this section too. Fill in the ‘No. of Packages’ box with the quantity you are ordering. Fill in the ‘Size of Package’ box. Note – we only sell our product in a 250ml bottle. Fill in either ‘Fatal-Plus Solution’ or ‘Fatal-Plus Powder’ in the ‘Name of Item’ box. Do not request any other product other than Fatal-Plus Solution or Powder. Remember to write out the number of lines used in the ‘Last Line Completed’ section. Do not draw lines through the unused portion of the 222 order form. Please make sure only the ‘Signature of Purchaser or Attorney or Agent’ signs the 222 order form. We will do signature comparisons. If you need to use a Power of Attorney, please make sure we have the proper paperwork to process your order. Keep the blue copy of the order form for your records. Do not take any carbons out of the form. Include a photocopy of your current license (the license for the person signing the form). All orders from all states must also include a photocopy of your state narcotics license. Include a business card with your order. We need your complete contact information on file in the event we need to contact you regarding your order. Your completed 222 order form must be mailed to us, we cannot accept faxed or emailed forms. Your order will be filled on a first come, first served basis (assuming your 222 order form is properly completed). First time customers (and delinquent accounts) will be required to pay in advance for their entire order. Shipping costs are not included in the price of the product. We ship our products via UPS Ground, unless the recipient agrees to pay an additional fee for expedited shipping. If you have any questions, please feel free to contact us prior filling out and mailing your 222 order form. 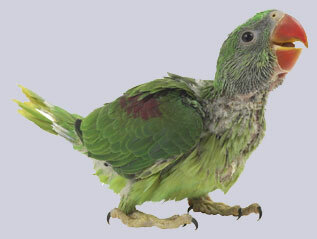 If you prefer, our products are also available for purchase through most major veterinary distributors. Thank you for your cooperation and understanding, it is greatly appreciated. For the Following states, you must order Fatal-Plus Solution or Powder through a distributor. Our products are available through most major veterinary distributors. Please check with the distributor of your choice. Fatal-Plus is also available through these veterinary distributors.